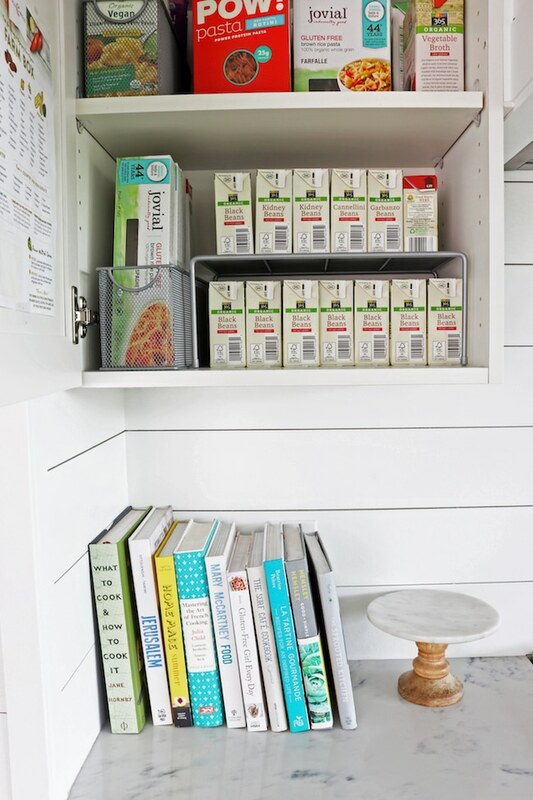 Who loves organizing? Or maybe a better question, who loves an organized space? I‘ve promised y’all for awhile that I would open up more of our cabinets and drawers to show you inside. 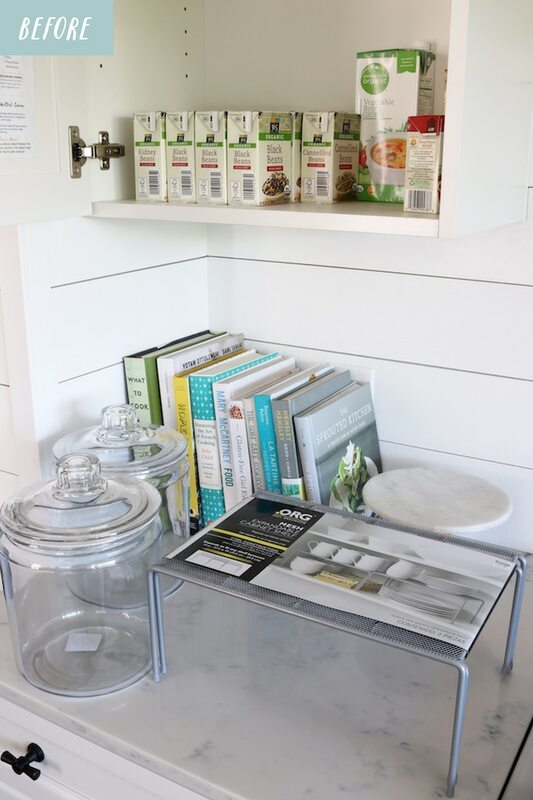 So today I’ll be sharing Before & Afters of four areas in my kitchen that weren’t working for us along with the solutions we came up to make them work better, featuring some items we got from the Bed Bath & Beyond .ORG line. In a small (ish) kitchen (especially if you don’t have a walk in pantry or freestanding island for additional storage!) 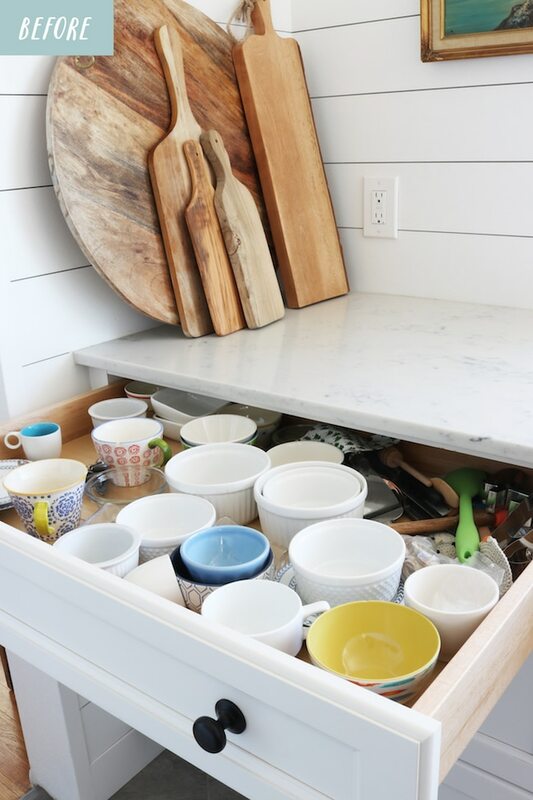 every square inch of drawer and cabinet space counts. Organization not only increases the functional space, but I think it enhances the enjoyment of daily tasks, too. Y’all know I love my coffee stations. My mug tree on the counter holds all of our coffee cups so that system was working well for saving space in drawers. But my other coffee supplies were not well-organized at all. Somehow I ended up with baking and coffee supplies in one drawer, with a bunch of other random stuff thrown in. Gah. In my book, Simple Organizing, I suggest a kitchen be organized into zones for efficiency. While there are times particularly in a small kitchen where you might have to mix zones, there was really no reason for me to have baking and coffee supplies combined in one drawer. :) Yet, true confessions…I did. Ackkkk! This drawer was overflowing. It was so stuffed that some of the coffee supplies that should have been in the drawer had to stay on the counter and yet, some random baking supplies stayed. So a couple of days ago I finally took everything out, including the bags of our Christmas cookie cutters that took up one large corner of the drawer. :) Those can definitely be stored somewhere else besides the drawer I open on a daily basis! Once we took everything out, we only put back in the coffee and tea supplies. The .ORG organizers from Bed Bath & Beyond were so helpful in making better use of several drawers and cabinets. By grouping items together in the new bins, now we clearly know where to look and can see what is in the drawer the minute we open it. No more digging around or wondering where things are! You guys, now opening my organized coffee drawer feels like the heavens open up and angels start singing. It literally took just minutes to reorganize the drawer, but now it makes me happy every single time I open it. It’s the little things. We put our loose leaf tea tins together in an .ORG basket. The .ORG baskets are so perfect for organizing all the things. Our tea bags and little accessories are organized in a cool wood box with a lid (see the lid opening in the photo, above?!). The box is so attractive it can bet set up on the counter if we want to use it to serve teas, too. Now that our supplies are better organized I’m not going to be embarrassed when I’m offering guests a hot drink! Plus it’s like a treat to myself to make a cup of tea or my morning coffee. The drawer above it was also unruly. I love using it for little espresso cups, small bowls and measuring cups because it’s shallow. But because the space inside wasn’t clearly defined, it ended up with random stuff in it, too (including more cookie cutters, and I don’t bake sugar cookies except sometimes at Christmas, ha!). 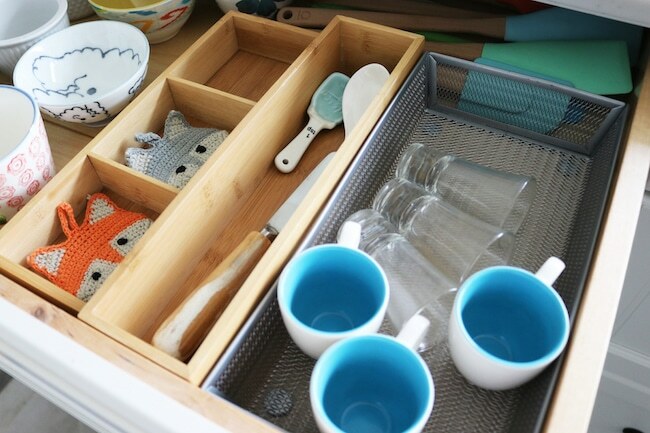 The thing I am always looking for in this drawer are the small espresso cups and shot glasses (the girls and I use them to drink our favorite health beverage every afternoon). Because the cups are small they were always hiding among the other objects. It was kind of like looking for E.T. in the closet of stuffed animals! But no more, now we’ve got a better system. An .ORG basket and a couple of wood dividers brought order to the entire drawer! 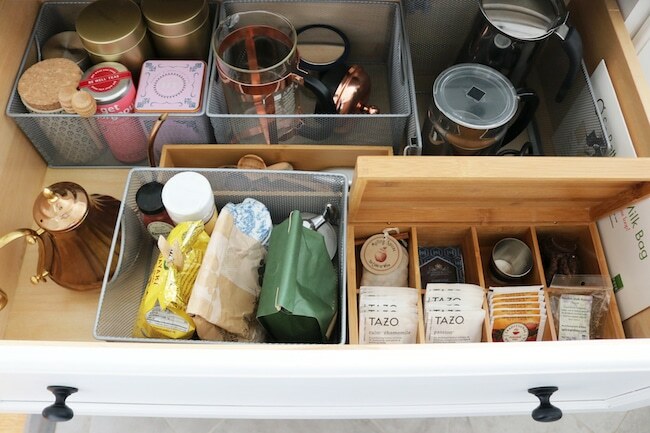 Our little cups have a home and there’s a space for everything we need. I also got the canisters that are on the counter above the drawers. Aren’t they adorable?! I love them. I’m thinking I’ll use one for ground coffee, one for biscotti to go with my coffee :), or maybe dog treats for the pups? This wall cabinet was a bit annoying to everyone, especially on grocery shopping day. There was no real system. It didn’t really look that bad, it just wasn’t tidy or efficient. 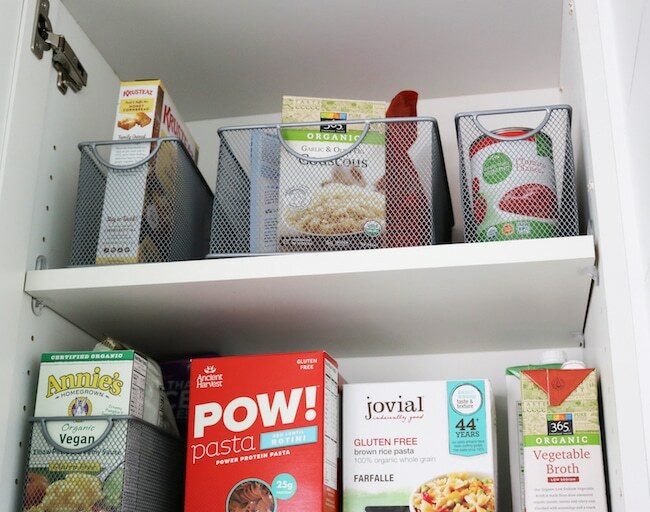 We thought about how to use the space better, and all we really needed was to group things together in easy-to-grab baskets and add a shelf riser. Easy peasy! Grouping items together is SO SIMPLE but it really makes such a difference. It not only looks less chaotic, but being better organized just makes you feel more aware of what’s already in the cabinet. Plus it’s easy to take a basket off the top shelf to see what the options are when you’re trying to decide what’s for dinner. The .ORG riser doubled the space we have for shorter items like boxes of beans. Now after we grocery shop to restock, we don’t have to pile boxes up and then watch them all topple over and out of the cabinet when the one we want is at the bottom. :) Fun pre-dinner activity, yes, but who’s got time for that? 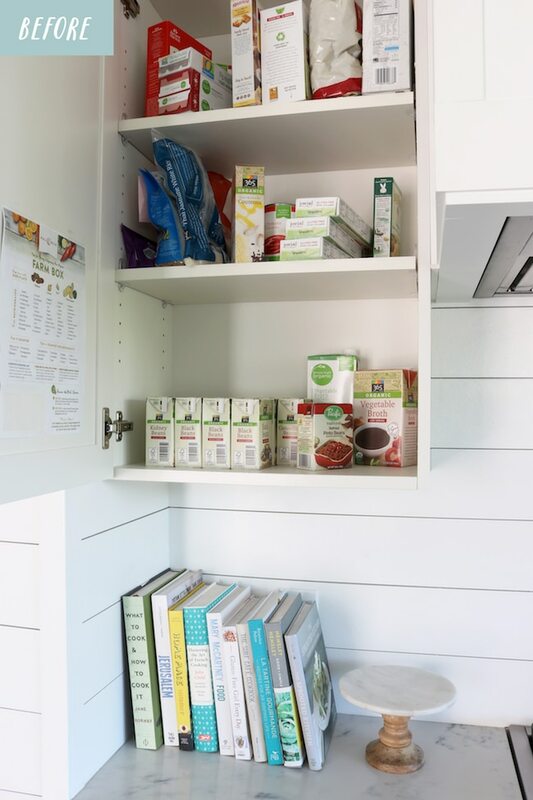 I love the two roll out pantry drawer cabinets we were able to literally squeeze into the kitchen when we remodeled. We have one on either side of the fridge. 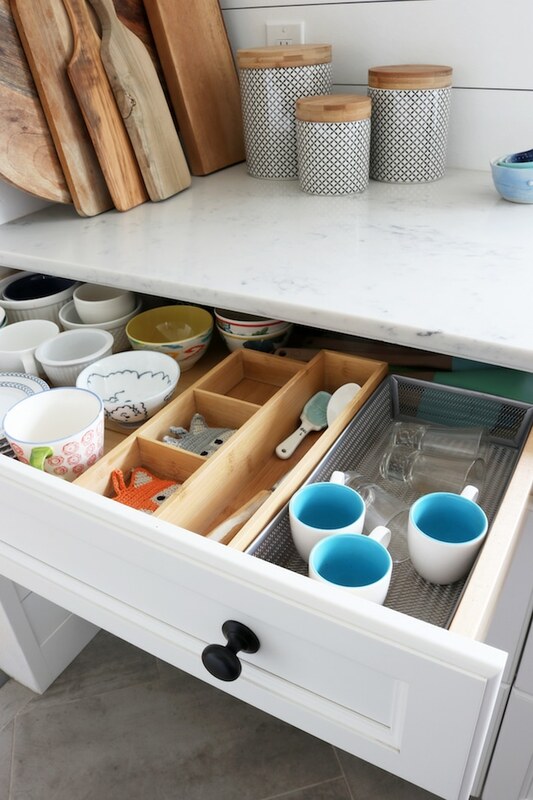 It’s so handy to be able to pull the drawer out, you can use the entire surface and see all the way to the back so nothing gets lost. 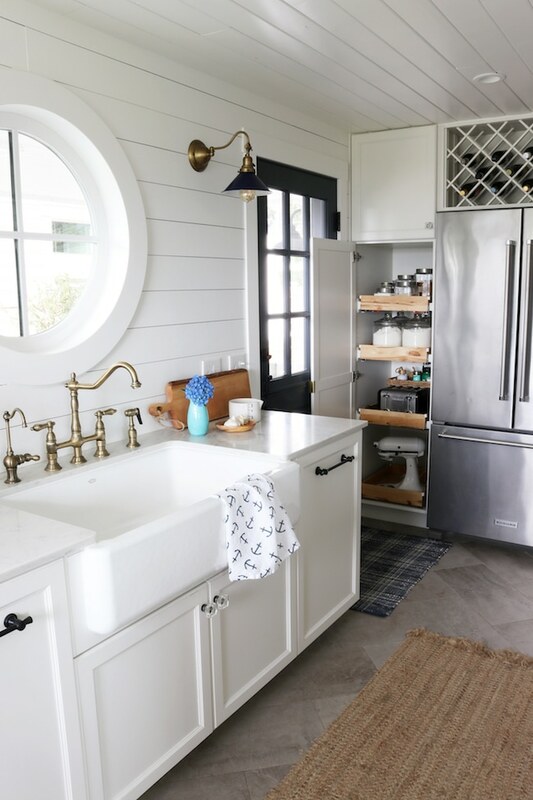 TIP: If you are remodeling a small kitchen, you will want to measure very carefully to make sure you are not only maximizing each available square inch, but that you will also be open cabinets and drawers. Ha! The person who first measured for our roll out pantry cabinets measured incorrectly. Fortunately we double checked before the order was placed! Crisis averted and these drawers open with ease. The contents of our pull out drawers didn’t look horribly disorganized, but I was excited to streamline everything and be more intentional with our storage here. I don’t like to keep food in bags, so we added more jars! We used these vintage style jars and this set of square ones. We also moved our mixer to the bottom pull out. It was often on the kitchen counter but we don’t use it regularly enough to justify the counter space, so I kept it downstairs sometimes. But I didn’t like lugging it up from the basement when I needed it! Since we had the room for it in this cabinet, keeping it here is still convenient but frees up the counter when we don’t need it. We do the same with our toaster! My next step will be to label the jars to make it easier for all chefs in the kitchen to identify the contents. We tucked another .ORG bin behind the glass jars to corral little items and things that aren’t in jars. It’s easy to see what’s in the bin when you roll the drawer out! I’m feeling great about how functional this cabinet is now! 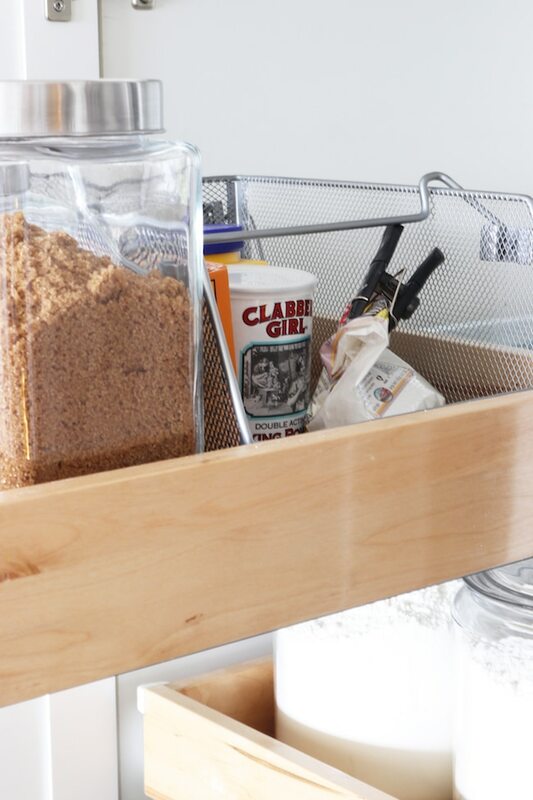 What’s the most disorganized drawer or cabinet in your kitchen? I love your ideas, so much that when I saw your post, I quickly opened my shelves and dumped out everything and will start over! I do have all the teas in one drawer, so nice for DH to get his moring tea without disrupting everything else! I always admired your painting f the tranquil ocean with a sailboat, rocks and seagulls – is it original? Yay, that’s great, Betty! Hope you feel more organized. And yes, the painting is original! I’d love to have more like it, I found that one at a flea market one time. Fun pre-dinner activity!! hahaha It always happens when you are in the biggest hurry too:-) Love your organizing ideas. I have a few drawers that are perfect, but this inspires me to attack the other areas that are a hodge-podge of mismatched items. Haha, so true! That’s when the avalanche usually happens. Most of mine were pretty organized, so it felt great to finally tackle the others! ENJOY! This is inspiring! We all have areas like this, I know I do especially in my kitchen. 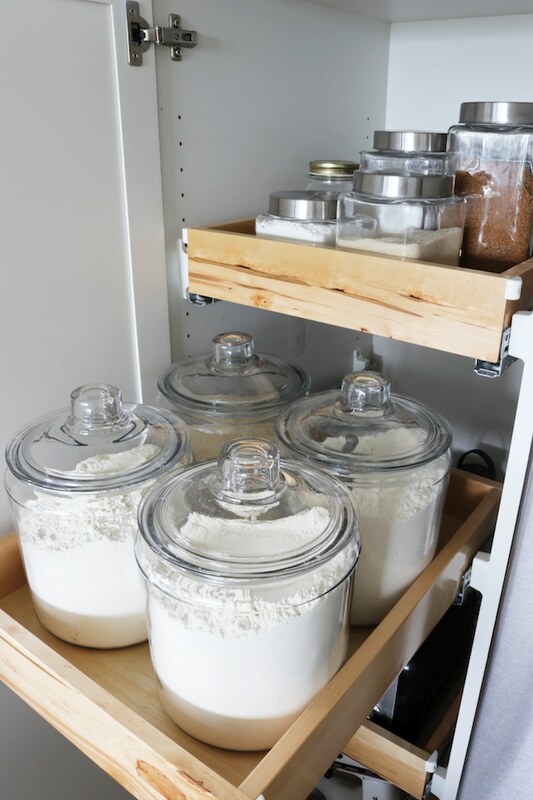 It’s not a disaster but it could be more efficient and organized! Great ideas! I’m ready to be organized! Wow….super organized now! 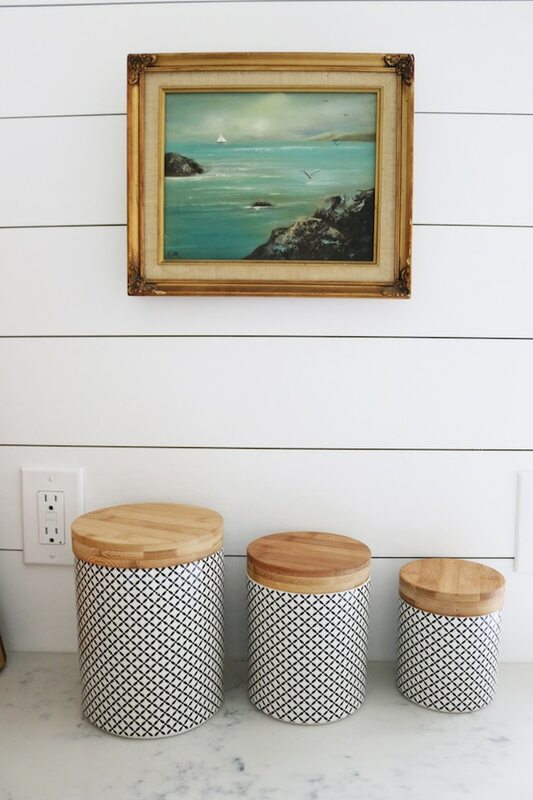 Love the wood topped canisters on the counter. My worst drawer has to be the measuring cups/larger serving utensils/misc kitchen hand tools. That is where I need to try out your trays etc. Thank you! 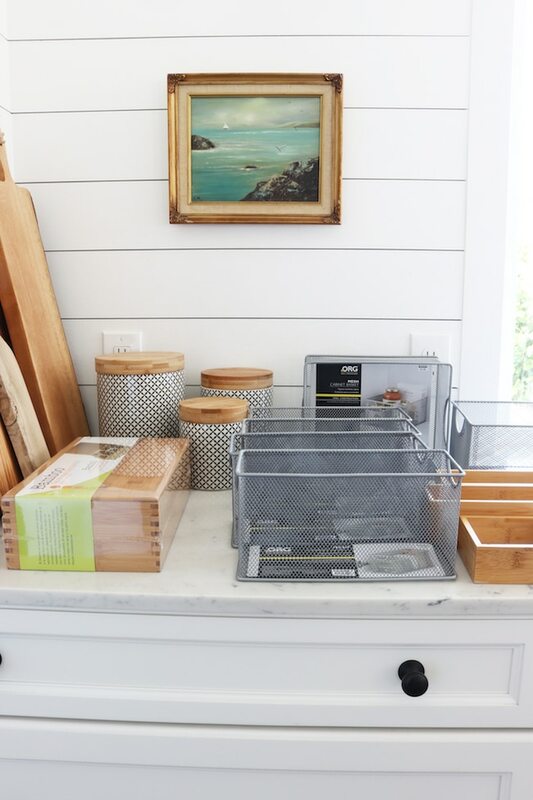 Yes, the trays and baskets really make everything feel a little less chaotic! When we moved in to this house, I came prepared with boxes and bins and shelf/drawer lining. So far, so good! 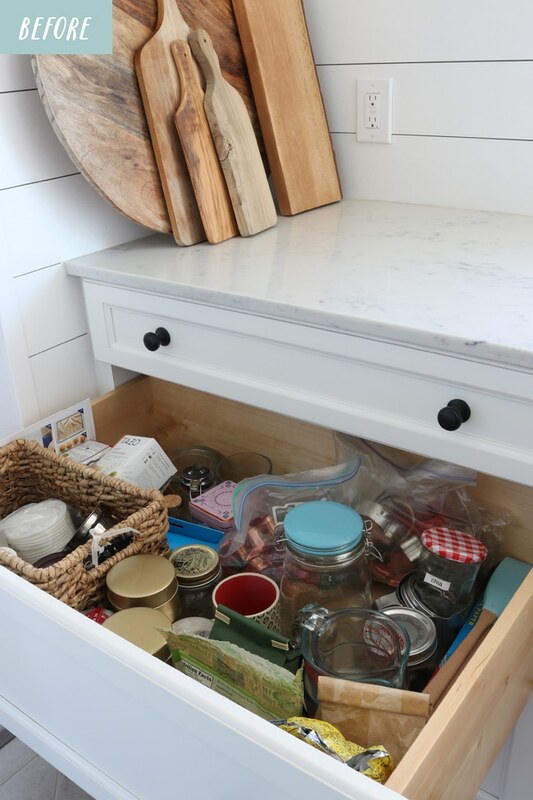 But the only drawer we’ve struggled with is our “junk drawer” despite the baskets in there to keep things in order. It still always looks messy. Thankfully, it’s the only one so I don’t think I should lose any sleep over it! Your organization is great. Thanks for sharing! I just did this same project about 6 months ago! It’s not completely done, but I made a huge dent and it makes such a difference. You have inspired me to finish! Thanks, Cherie! It really does make a difference, even if you can just do a one or two spaces at a time! I also have one cupboard in my kitchen that has 4 pull-out drawers like yours. I really do like it. It’s so much easier to see things. I also put my mixer (like yours) on the bottom pull-out. The weight of the mixer was so heavy that it bent (broke) the pull-out. I just wanted to caution you about that. Wonderful tips and cute containers for all of your goodies. Oh no! Thanks for the warning! We did get heavy duty slides /hardware on ours, so that might help. But I was also thinking I could just grab the mixer out and not even slide it to be safe! You give me the best ideas! Im moving my toaster to a slide out drawer with pots and pans below where its at on the counter. Theres space on that shelf being wasted amd I could really use the counter space. Glad you found some inspiration, Dana! Thanks for stopping by! 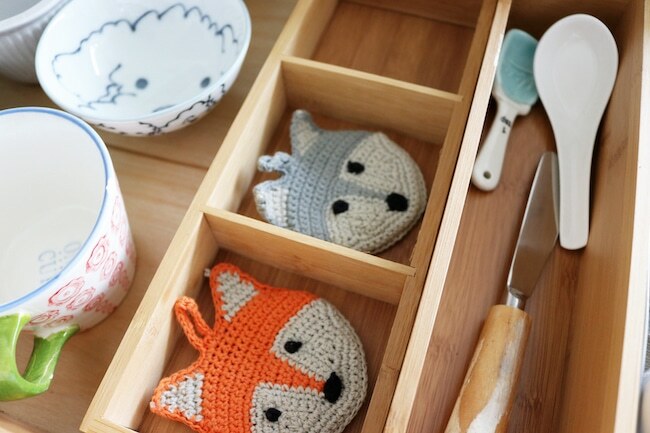 The little fox scrubbies are too cute. I thought they were coasters at first and what I would use them for, and was wondering where you purchased. You have the cutest, unusual items, and than you for all the tips and helpful ideas. It helps so much when one is trying to get organized, and have a neat and organized living area. Yes, I too need to know how you found/made the fox scrubbies! Is there a pattern or link you can share? I just LOVE your kitchen! I just grabbed all of your books from our library and I’m excited to look through them! Quick question, I checked your sources page and I couldn’t find where the fox scrubbies are from. Did you buy them somewhere or make them? They were SO cute! I have an 8×10 kitchen. My only cabinets are along an 8 foot wall, and consist of 2 base cabinets, a sink cabinet and 2 wall cabinets (one on each side of a window). Due to the layout of my kitchen, I have no opportunity to add any more cabinets, I have no ability to have a built-in dishwasher, and I have no ability to put any cabinets around my stove. My dishwasher is a small counter-top unit that takes up one-half of my countertop space. 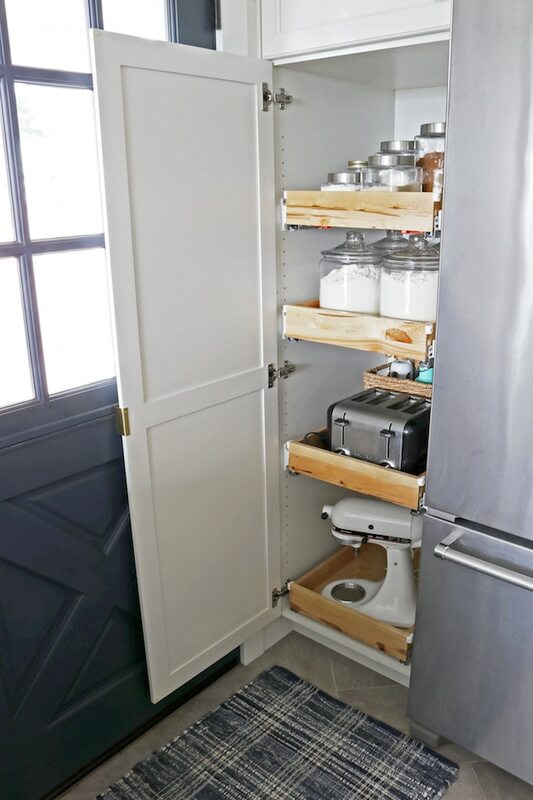 I am throwing down the gauntlet and challenging you to find room for more storage in my kitchen. 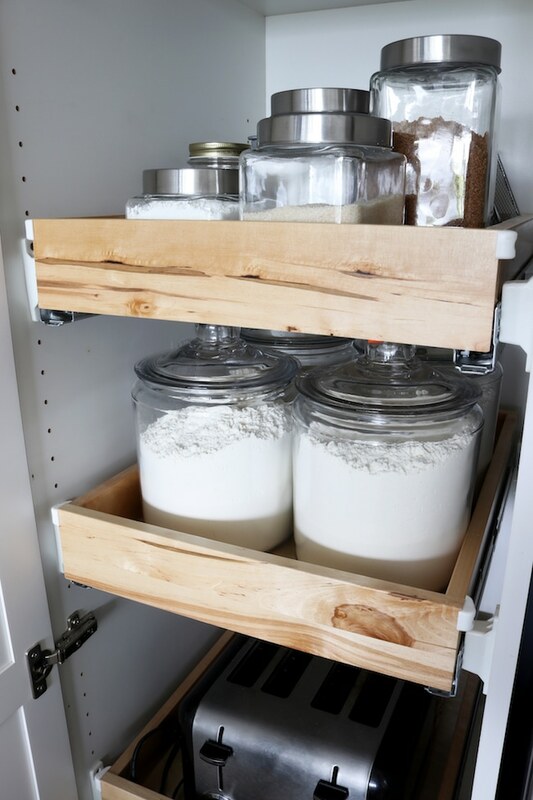 Could you add storage outside of your kitchen to store additional items? 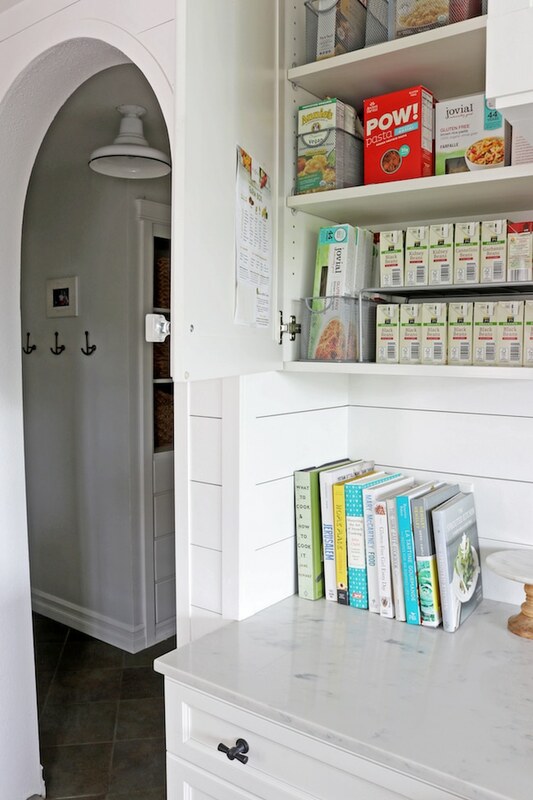 I hang my measuring spoons and cups from Command hooks on the inside of my cupboard door. More drawer space freed up plus I can find these so much easier. 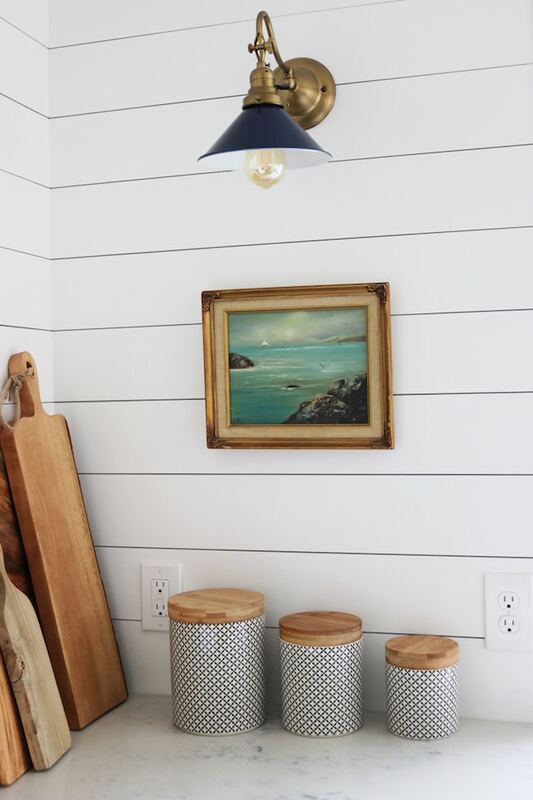 My kitchen isn’t small, it is normal I guess, but these ideas are great for any size kitchen! 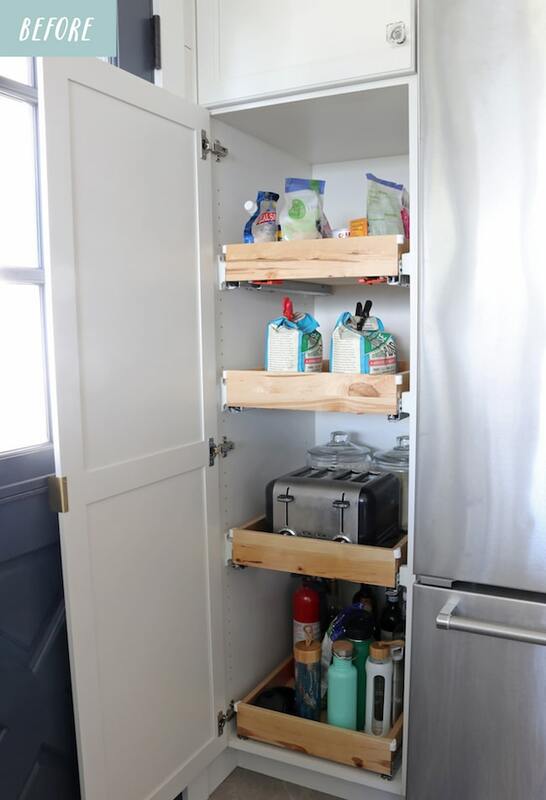 These are great ideas and I’m anxious to follow your example and reorganize things in my small kitchen. I would love to have help organizing my drawer freezer in our new refrigerator. Great ideas! Love them all. One question. Where did you get the gorgeous seascape? That looks great and organization saves time. 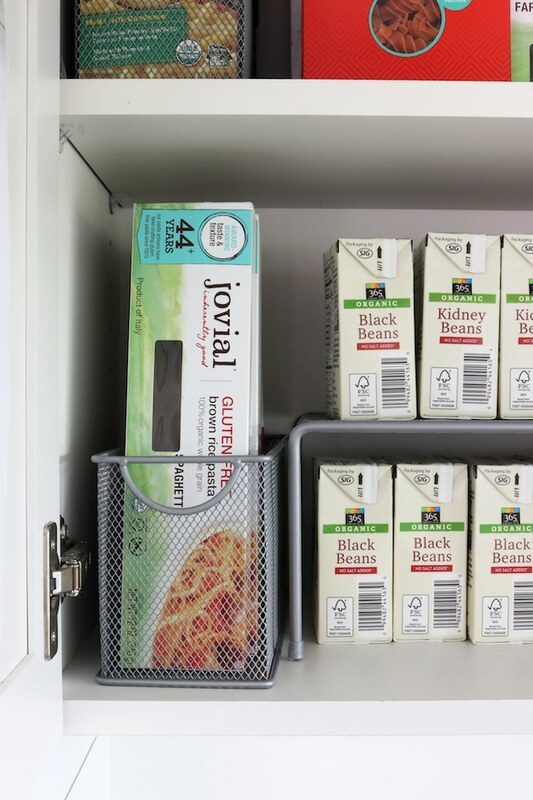 We have those BBB metal organizers throughout our kitchen and I enjoy them. 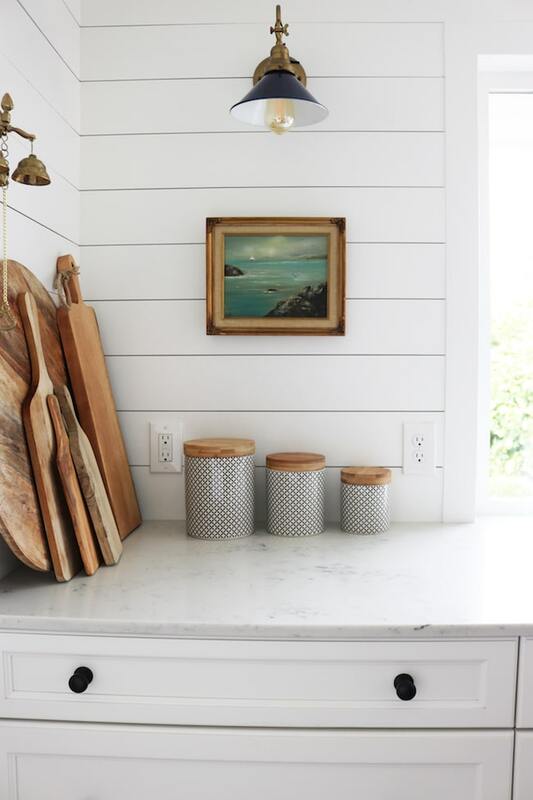 They come in every size so I have the smallest for my measuring spoons, the silverware one, the long one for my knives, etc… I like the look of them in your beautiful kitchen, too. 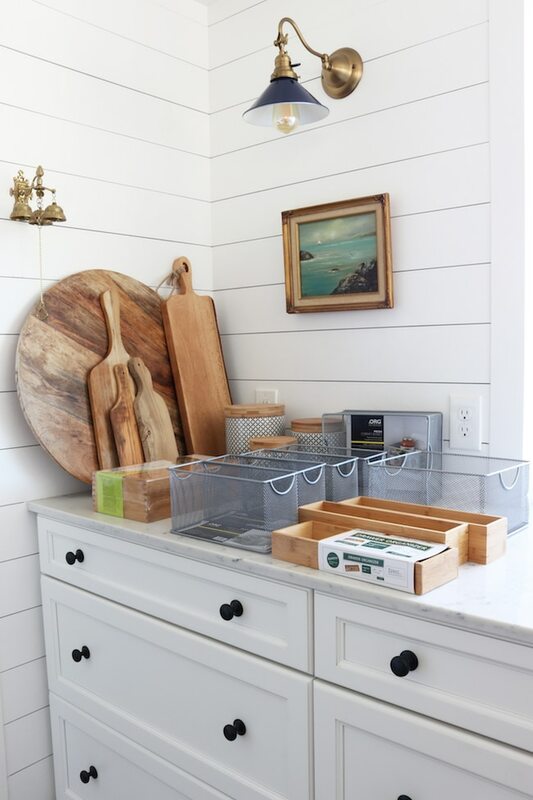 I need those mesh baskets for my kitchen.They are perfect for organizing stuff.